Batch change the suffix of files. Is there a better alternative to Xiafunge? Is Xiafunge really the best app in File Management category? Will Xiafunge work good on macOS 10.13.4? Xiafunge is a utility for changing the extensions of files. Xiafunge needs a review. Be the first to review this app and get the discussion started! Xiafunge needs a rating. Be the first to rate this app and get the discussion started! To use: Drag one or more folders (or files) on top of the Xiafunge application in the Finder or the main window. Xiafunge immediately begins to traverse the folders and all their subfolders changing the extension of all files that match the "from extension" to the specified "to extension." 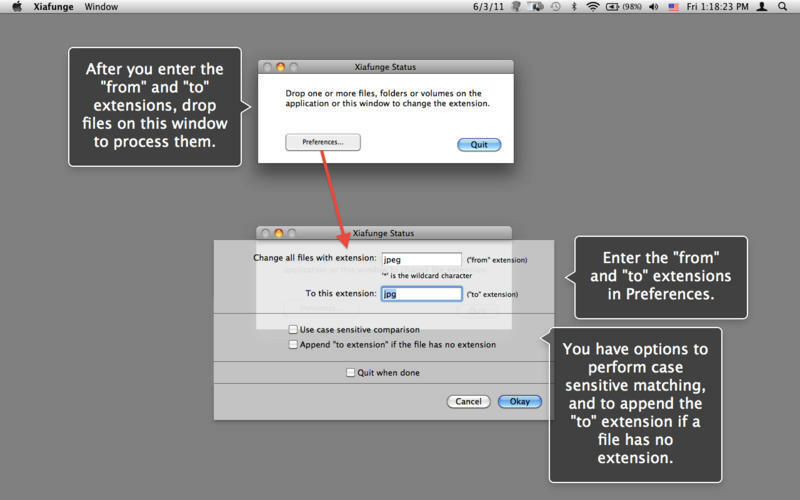 Use the Preferences window to configure the conversion. If the "from extension" is blank Xiafunge will append the "to extension" to any file without an extension. If the "to extension" is blank Xiafunge will delete the extension of any file that matches the "from extension."